Restoration of all your office furniture and machinery; completed in your office while you sleep or at our shop! The basic law of electricity states: opposites attract. This is what electrostatic painting is based on. The item to be painted is given a negative charge, and the paint is given a positive charge. The paint is then atomized through a special round revolving nozzle. The object actually attracts the paint; the paint is not sprayed on, instead it is plated on. The paint can actually be pulled around corners, making sure you have a smooth even coat. More importantly, there is no overspray. 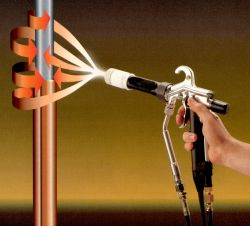 Conventional spray guns may leave a fog or mist of paint, but this is not so with electrostatic painting. It is remarkably neat and clean. 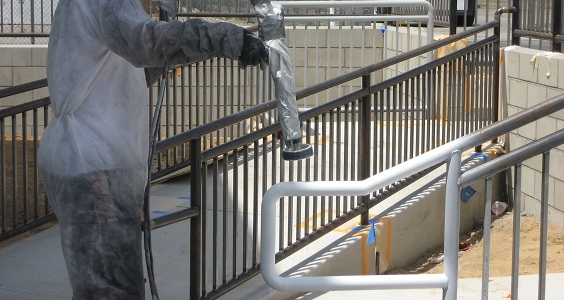 On-site electrostatic painting refinishing involves the complete cleaning, resurfacing, and re-coating of items that are at or near where they are used. It is usually done in carpeted offices or other places where overspray and contamination must be kept to a minimum. The primary concern is that crew members or operators do their work in a tidy manner. Electrostatic Precision Painting uses 2 basic steps: cleaning or prepping of the surface for painting, and the actual painting process. Everything on the outside of the object being painted is cleared, but it is not necessary to empty out interiors. Using a grounding wire and clamp, the objects to be coated are grounded to the nearest available earth ground. This could be any metal portion of the structure of the building. As with any electrostatic painting, the surface of whatever is being painted needs to be clean of all debris, to ensure the adhesion of the film coat, and the look of the final finish. This also includes rust, scale, and peeling paint. This can usually be done with wet or dry sandpaper. We will skillfully refinish any metal surface with coating of equal or superior beauty and durability to those used by new equipment manufacturers. Our experienced craftsmen will make your desks, file cabinets, tables, storage cabinets, chairs, metal door and window frames, elevator doors, bathroom partitions, lockers and railings look better than new through electrostatic refinishing. Services also available for plant, facility, and manufacturing machinery and equipment. This refinishing process is safe, clean, and non- flammable, as well as AQMD and environmentally approved for on-site in door use. Pick-up and re-installation also offered if needed.